This October I have been on the road A LOT. At the beginning of the month, I had to drive from Vermont down to Connecticut to pick up my friend Aaron. On the way back, we found this Lord of the Rings machine at a gas station in upstate New York. It was well maintained and played like a dream. We put in two dollars for 5 games, and on the last game I got a replay, which we left on the machine for the next road warrior who passed through. Later that same week, Jon and I drove down to Boston to pick up his Jurassic Park pin, which he mentioned in his last post. I got my Medieval Madness machine in Boston too, so the trip felt very familiar. Same car, same guys, heck, we even stopped at the same sandwich place on the way home. I've got to say, there is something very special about driving home with a pinball machine in the back of your car. I think that's about as close as you can get to living the American dream. Lastly, Claire and I just drove cross country (from San Francisco back to Vermont). 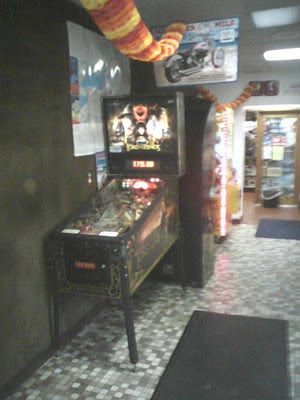 The only pinball machine we saw on the road was a Pirates of the Caribbean at an Ohio Turnpike travel center. All these rest stops are built with the same layout, so I can only hope that there is a pinball machine at every stop in Ohio! We made it safely back home to Vermont, and when we arrived I found that "Foggy" (my Medieval Madness machine) had a new friend! Lastly, This morning Jon and I received an email from AJ over at Syndicate Product, who wrote the first review of Drop Target #1. Good news, she liked it! Sorry this is late. 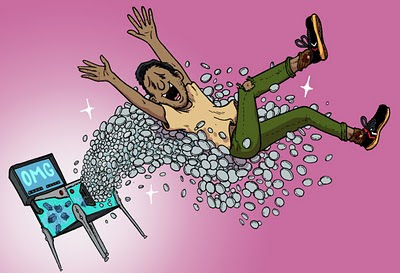 Well, I know that I never SAID when I would put up pinball illustrations, but I meant for them to go up on Sunday. 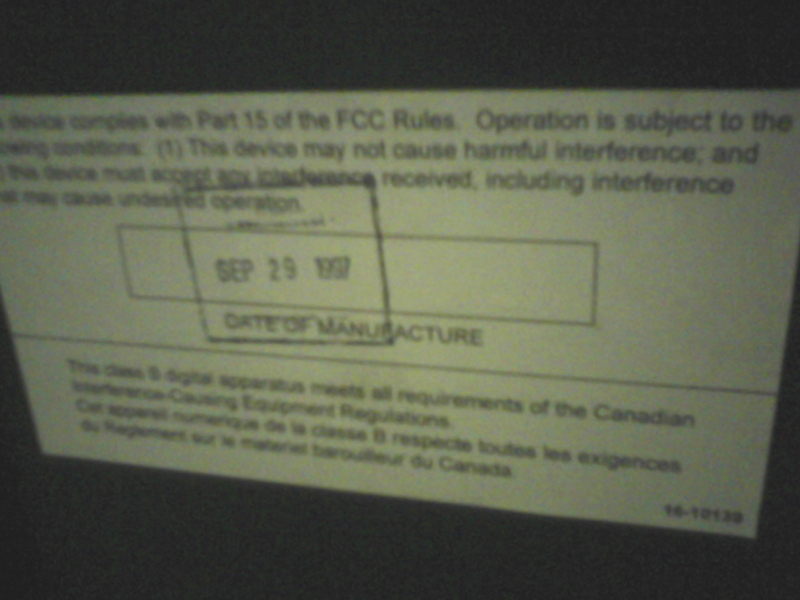 I am not the PROUD OWNER of a 1993 DATA EAST JURASSIC PARK MACHINE!!!! Isn't it BEAUTIFUL!?! It's pretty much the coolest thing ever. The game plays incredibly fast, and the flippers are unbelievably responsive. There are a lot of moves that Keith Elwin shows off in the Pinball 101 DVD that I haven't been able to pull off regularly on most machines, but this bad boy is more than up to the task. There are so many modes to start up. 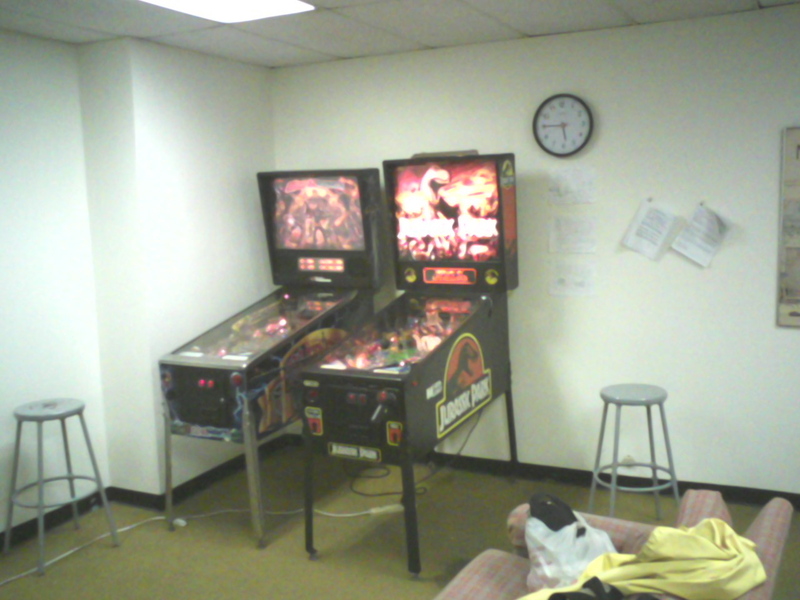 There's a 6-ball multiball, and a giant T-Rex head that eats up the ball! IT'S THE COOLEST!!! 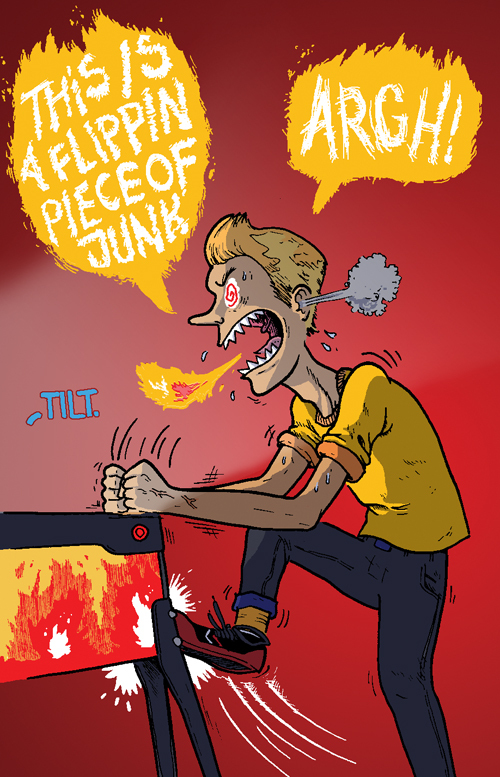 Originally, the illustration I was going to post was going to be me triumphantly high-fiving my new machine over an exploding volcano, but I chose the fixing-up one because that has been the theme of my first week of pinball-ownership: fixing. I got this machine for a really sweet deal, but it came from an operator's route, so I new it wasn't going to be perfect. THAT WAS WHAT I WAS HOPING FOR, THOUGH! Tinkering and fixing up Alec's Medieval Madness machine with him has been a blast, and when I was scouring the globe (er...New England) for my own machine, I was partially looking for a project machine to shop out. All of the fixes have so far been minor, save for the laft flipper being deader than disco. Turns out that there was a bad soulder on the grounding wire and I just needed to re-soulder it. I've been refering to THIS online manual A LOT lately, and it's been an AMAZING resource! This whole pinball machine ownership has taken everything to a whole new level. It's going to be a really amazing adventure. I'll keep you all updated on what's going on. Ha ha, also, MY APOLOGIES TO MY GIRLFRIEND! Well, I don't want to bog you all down with blog. BLOGBOG. I'll have some fun Halloween stuff for ya. We ALL know how THIS feels. *Sign* Well, just another day in pinballdom. Sometimes it feels like the machine is programmed for pure evil and every loving, encouraging nudge you give it just throws a danger-danger-tilt back in your face. I know that we should all be exercising a quantity of restraint. In all seriousness, though, I don't tilt that often 'cause I'm too shy to put a little bit of the oom pah pah on a machine. My girlfriend Colleen tilts more than me 'cause she's so pumped about the ball hitting around in the bumper pit. It's cute. I have some AMAZING news to share with you guys, once I can get a glorious enough picture! Stay tuned! Also, I saw this on a show report on Pinball News from 2 years ago. IT MAKES ME SO HAPPY! Also, I'm probably not revealing hot, breaking news with this one, but THIS is super-duper cool! 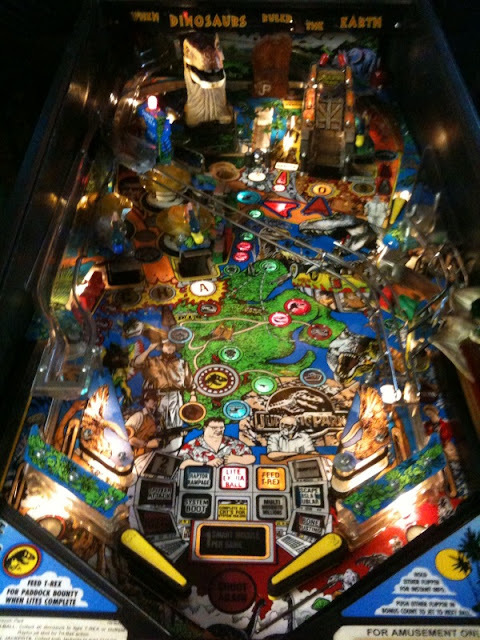 This is the Visible Pinball machine that Micheal Schiess built. It seems like it would be super-duper distracting to play, because I'd be looking underneath the playfield and back box too much! I heard it was at PPE4 this year! Just another reason I have to get out to the west coast to play! 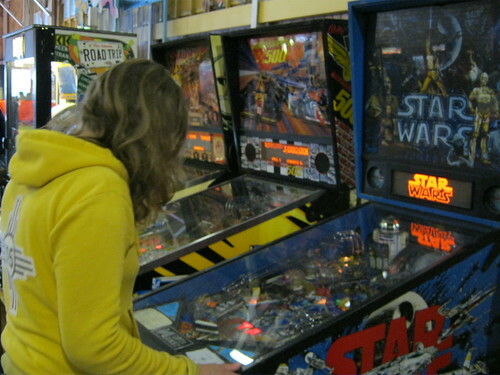 Claire has continued to find more pinball machines in Australia. Here is a pretty sweet bank of them at Luna Park in Sydney! Also, it looks like I was wrong in my earlier post, where I said Claire found a 1976 Star Ship pin, it was Star Trek! Thanks to Vicki for taking all these awesome photos. First of all, that image above pretty much illustrates the dream. Now, I have a really awesome girlfriend, but the idea of playing pinball SO GOOD that some girl starts getting interested in you is incredible. I've been doing a lot of color pinball spot illustrations lately, and I'll be posting them up from time to time. 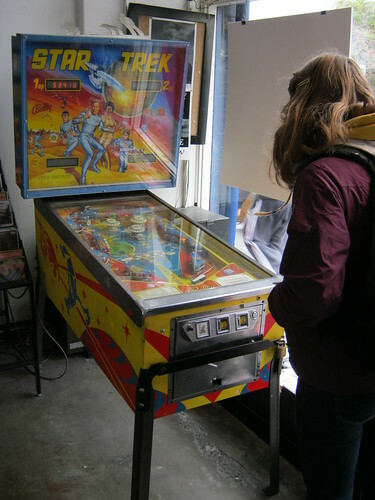 I was biking around West Lebanon, NH today and I decided to take in a game of pinball at a pizza place, Lui Lui's. They have exactly one pin, Twilight Zone. The machine's condition could be described as "shoddy" at best. Both the gumball machine and the clock are completely dead, and the playfield is just filthy filthy filthy. Now, all of this is on a GOOD day. Today was a new low. 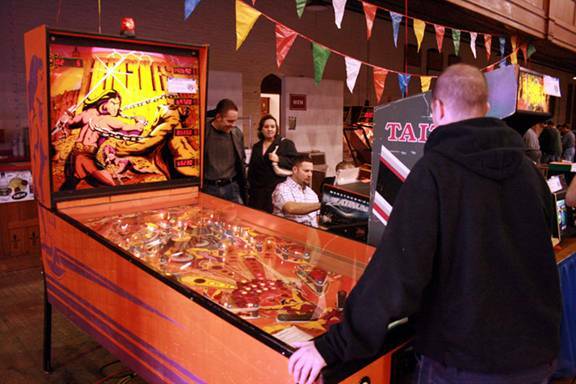 THREE balls were jammed in various places around the playfield, and the machine was continually shooting off solenoids in an attempt to free the balls. The sounds of this poor machine shooting off it's coils again and again broke my heart. It was pleading for help, and I was powerless. What about the poor people in that restaurant just wanting to enjoy their pizza in peace and quiet? 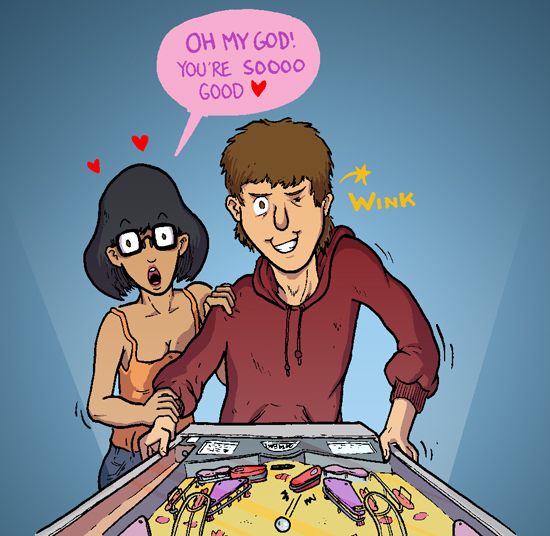 They probably left thinking, "pinball, ugh, WHAT A RACKET!" So, in hopes that I could restore even one shred of dignity to this noble pin, I found the operator's sticker and called them! I mean, THAT'S WHAT THEY'RE SUPPOSED TO DO, RIGHT!? The operator picked up and actually seemed happy that I was calling from Lui Lui's, like I was breaking some long duration of enforced incommunicado. When I told him that I didn't work for the restaurant, he seemed disappointed and told me that an employee would have to place the service call. When I tried to relay that to a manager that I caught that wasn't busy, he DID NOT want to hear about it. I even tried to coax him with, "You know, there's a bunch of us in town that really love pinball, and we'd be really excited about a working Twilight Zone game..." but this guy was flat out IGNORING me. Oh well, in the long run, there are a good amount of pins to play in the area, and being down one isn't the end of the world. In happier news, I found this archive of images squirrled away on the interweb of a warehouse raid. Look at all the pinball machines all stacked on each other! It's pretty much the most beautiful thing I've ever seen! HERE is the link. This really never fails to cheer me up. 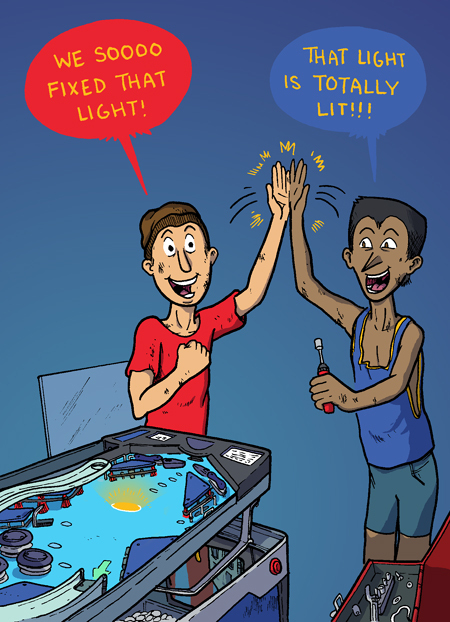 It's the ultimate tag team pinball experience. It's, like, CROSSFIRE, on speed. It's awesome awesome awesome. 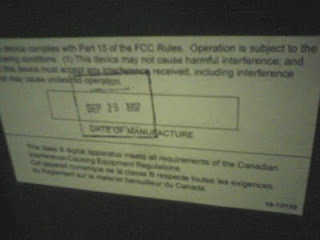 On the back of my Medieval Madness pinball machine, there is a stamp, from the day it left the factory: September 29th, 1997. This means that "Foggy" (as we like to call her) turned 13 years old a few days ago! 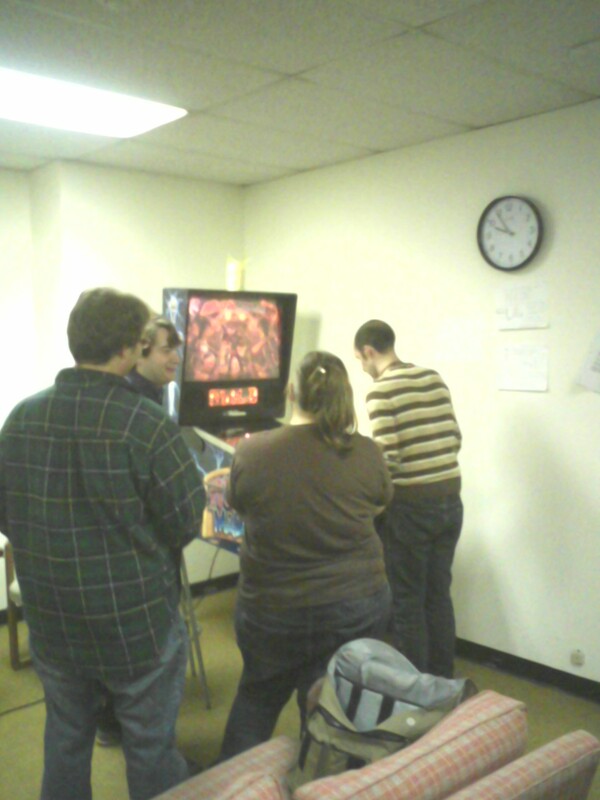 To celebrate, Jon and I had a pinball night at the school, where we watched TILT: The Battle to Save Pinball, and then we put the machine on Free Play for anyone who wanted to play. Here's a shot of the action, which went until almost 1am! 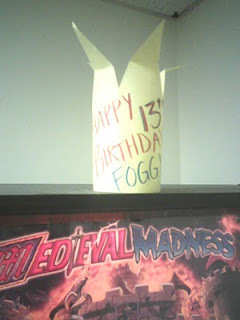 Beth Hetland even made a little birthday crown for Foggy! It was a special night.